Oxidation causes iron to rust and this is the single biggest weakness for anything made from steel. If your car has fallen victim to rust, don't worry because a rust converter can magically heal it. Rust converters may vary slightly but they all have the same working principle based on chemistry. The first step is converting the rust itself into iron tannate using tannic acid. This effectively kills the rust. The second step is creating a protective cover on the surface against oxidation agents using 2-Butoxyethanol. These two processes combine to create your average rust converter, although different manufacturers offer different options which may or may not benefit you, depending on the problem at hand. In this rust converter review, you'll learn about the best rust converters in the market and additionally get a buying guide to help you make the right choice. Evapo-Rust is a top-rated rust converter, known for its high quality and its non-toxicity. This rust converter produces results effectively and it's reusable as well. It's also non-toxic and has no unpleasant odors. It is biodegradable and non-corrosive, which means it's safe for the skin and the eyes. You are free to use this rust converter even beyond your car and in the house for household items. You'll need a funnel to pour the liquid back into the container for storage. This is because of the rather small container opening, else it's easy to store without any worries. VHT Specialty Products makes an impressive offer here for those on the search for the best rust converter spray. This one comes in a 10.25-oz can and it's ready for spraying. It stops rust immediately on contact and additionally blocks any future rusting on the part. You'll need to leave it for a full 24 hours to cure completely though, as it turns from a clear liquid into a black metal, which forms a protective coating on the metal piece. From PlastiKote comes the 624 rust converter, which is a completely organic formula. This means that it's entirely safe on the environment and it leaves neither hazardous nor toxic materials from use. This Plastikote rust converter formula bonds strongly with the rust on your metallic object or part to form an entirely new and very strong metallic surface. This new surface can get painted after 24 hours and you can even sand it first to create a smoother surface. PlastiKote guarantees that it won't cause a bleed through stain on top coats but it does have its issues, which for instance, include its harmful vapor when inhaled. While you'll have to wait for 24 hours with most of the other products on this list, this one offers you a very fast curing time of just 2 hours. This means that you can either paint or be done with the metal part in just 2 hours. The bottle also comes with a spray head, allowing you to easily spray the solution wherever you need it. You can also use brushing or dipping if that's better for you. This offer does have a drawback though, and that's the phosphoric acid in the formula. This makes it corrosive and potentially irritating to the skin and eyes, but it's biodegradable, so it's still environmentally friendly. If you want the best rust converter you can lay your hands on, then FDC makes you a good offer here with their Rust Converter Ultra. It offers you a very durable bond, coupled with economical use. You'll get a coverage of up to 500 square feet from 1 gallon of this formula and this beats most of the competition. The formula also stops rust immediately, as well as preventing further corrosion. For disadvantages, this formula does have a higher price but which can easily be justified by its quality. It also tales up to 48 hours to cure completely, which is far from the fastest on this list. Here's another rust converter that you can also stretch out. The 1-quart bottle can cover up to 125 square feet, which means one gallon of it will reach up to 500 square feet. The application is easy and can get done with a brush or by spraying. This formula also functions as a very good primer for painting on, although it needs up to 48 hours to cure. It's also Eco-friendly, made from a water-based formula, which is non-flammable and completely safe for the environment. There are times when you just need to touch up small rusty areas or when you are working on a larger project but you also need to work on harder to reach areas. Simply direct the can to spray it wherever you want and the rusting stops, plus you get a strong protective coat. Each can will handle up to 24 square feet, which amounts to over 200 square feet per gallon. The only down part to this spray formula is that it comes in a rather small car and it can only get sprayed. So it's not ideal for large projects. Ideal for use on cars, household and marine projects, this rust converter penetrates your metal parts to produce a new metal that's well coated and resistant to rust. It eliminates the need for expensive sanding and other expensive restoration methods. Just paint on the milky-white solution and the metal will turn black once it gets fully converted. The formula is water-based and environmentally friendly. It creates a moisture and salt-water resistant surface that's also a good primer for painting. If a Black Star rust converter is what you're after, then here's a deal from MRO Chem for 1 gallon of their Black Star rust converter. Each gallon will cover about 400 to 500 square feet and will convert the rust on your metal part to a black metal covered by a lick polymer resin coating. Black Star offers you an industrial strength rust conversion. It's used everywhere from oil rigs to fences, marinas, and of course, on cars. It kills all rust instantly and protects your metal for the future. The Black Star rust converter is a well-known formula that's very popular and in use by a range of organizations, including coast guards, oil rigs, and so much more. It's not every job that needs a gallon of rust converter, so a smaller quantity would do. Also, coming in an aerosol form makes it easier to apply on certain hard to reach areas. This aerosol spray-can has the same formula that instantly kills rust and develops a hard polymer resin coating to protect your metal items from water and corrosion. The Krud Kutter RX32 is a 32-ounce rust converter that is ideal for preparing any rusting surface for painting. It blocks the rust and prevents it from further developing and it's a good primer as well. What this rust converter lacks though, is a strong protective coating like the Black Star rust converters from MRO Chem have. With a few coats of paint though, they'll stay protected for a long time. The formula is water-based and biodegradable, and this makes it environmentally friendly as well. Each bottle will cover anywhere from 50 to 75 square feet depending on how thickly you apply it. 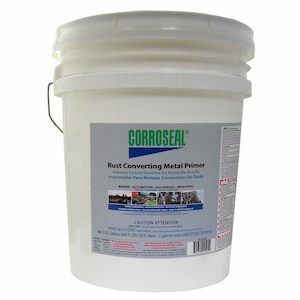 For those on the lookout for the best rust converter for car parts, Corroseal offers this water-based rust converter and metal primer, ideal for painting on with a brush, rolling and for spraying. The formula is water-based, non-flammable and non-corrosive. It's easy to clean up using just soap and water and this makes it very user-friendly, especially for beginners. You can cover up to 250 sq. ft. with a gallon of this formula. Corroseal also offers 1-gallon bottles, as well as smaller, 32-oz bottles for your convenience. One small disadvantage of this Corroseal rust converter is its price, which is higher than that of the competition. But then, one could argue that quality does have its price. It's important that you understand the different features of a rust converter and how to work with them. This understanding is necessary for you to choose the right offer and to get the results that you want. These factors are as follows but before continuing, do keep in mind that rust converters primarily work on metals that contain iron and that you may need to brush or sand off most of the rusted metal flakes before applying the converter. Different manufacturers package their rust converter in different ways. Some come in aerosol cans while others come in small bottles or in even larger containers. The project you have at hand will help you to decide which type of container or application method will be the most convenient for you. If you are working on a small piece or area, then an aerosol rust converter would be a great idea. If you have to work on a large piece like an entire rim, then a larger container that you could use a brush to paint with would be more convenient than a little spray can. Rust converters work based on chemical reactions which take time to complete. You'll always be safe if you leave between 24 to 48 hours after the application to either paint it over or do something else with the piece. The problem though is that you could be in a hurry or have limited time for one reason or the other. In such cases, you are better off with certain rust converters that promise shorter curing times before you can paint them over. For all other situations, the converter will come with instructions anyway, so you'll always know exactly how much time to work with. Some rust converters are easier to clean up than others. While many products on the market will easily stain your clothing and skin, you'll find certain offers out there that promise you can easily wash off their formula using just soap and water. It's recommended that you wear protective gear when working with rust converters anyway. This is not just because of stains but because they are also toxic. Rust converters are often toxic because they include phosphoric acid, which can cause irritation and inflammation if it comes in contact with the skin. Although there's no danger of severe burns here, it's still advised to wear protective eyewear and gloves to cover your hands, preferably rubber gloves. Last but not least, is the new coating's durability. Some manufacturers offer converters that don't need painting or coating in any way to protect it from the weather, while most manufacturers expect you to paint it over for some protection. We've reached the end of this best rust converter review and you've seen all the available products and what each one has to offer. From an extremely strong protective coating to the ability to get spread over a wider area and easier application, different companies offer different features that make each offer unique. This final choice, therefore, is yours to make, based on how much work you need to get done and on which offer provides you with the best features you need.